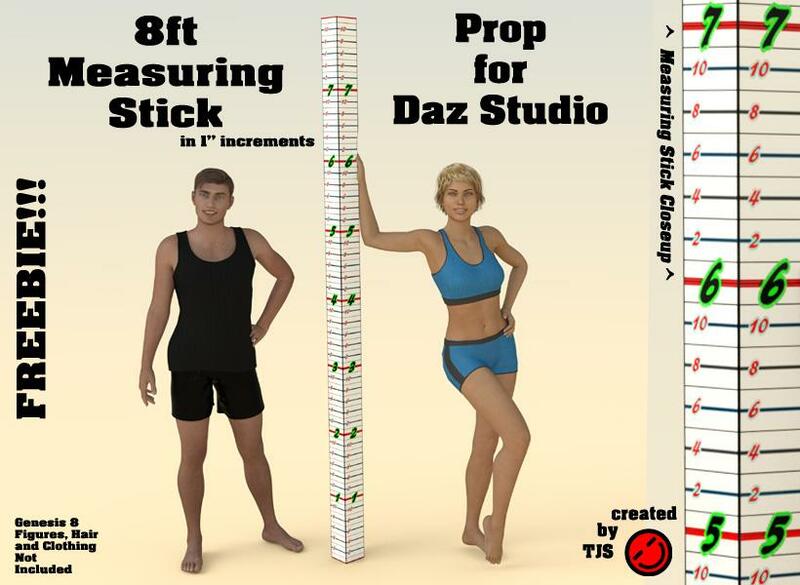 OK, I needed a pole with measurements on it for quick reference when working with multiple Daz characters, props, etc, so I made this prop. I needed something that I that could load quickly for comparison purposes when dialing in characters. I suppose you could also use it as a shallow stream/pool/creek depth guage, or for other uses. The .duf file is a 4 sided (plus ends), 8 ft. Daz Cylinder Primitive with a Ruler texture that I created in Photoshop from scratch. It loads very quickly, and I named the folder to make it easy to find (My Library/Props/8ft_MeasureStick folder). I kept it really really simple and tiny (the attached .7zip is a bit over 1.2 mb including the promo pic and readme). As such, it loads rather quickly. I hope that a few of you may find this useful. Unrestricted usage, just note where you found it (here) if you post it elsewhere (include my readme as appropriate)..
Let me know if you have any issues. This is my first 'official' freebie, so hopefully I packaged everything correctly. Looks better than the one I made for myself. Thanks, TJS! I love the idea of this measuring rod. Usually I use one or the other measuring-wall I've gotten from various places, but this one has the advantage of being more compact than those others. Hmmmm, I haven't been seeing that error, but then I probably have some file buried somewhere on my system. Thanks for the heads up guys! Let me take another stab at packaging this. Suggestions are welcome if anyone recognizes what I missed. In the meantime, if you want to 'throw together' said measuring stick, you can add your own cylinder primitive, and assign my texture to it. This is how I built it. Then you can simply apply the measuring stick texture in the My Library/Props/8ft_measurestick/8ft_measurestick_texmap folder to the primitive. The 8 segments isn't critical, I just wanted one segment per foot, for those viewport modes where you can't see the texture. OK, thanks for the error message, guys, it was very helpful. Just did some reading of forum posts about props via Google, and didn't realize that a /data folder was also created for my prop. I found the created folder, and am adding it to the .7zip for re-upload now. Will edit this post and the OP with the updated file shortly. Very very much appreciated Tim N and Nomad! I'm still learning how to package products for redistirbution (this is my first one) so you were extremely helpful in helping me 'solve' this one! Fixed it for me too. Thanks for the fast response. The graphics on the measuring rod do seem to be a mite jaggy, though... kinda making them hard on the eyes. Is this a hidden flaw in how the texture was applied, or did the graphics get corrupted? Anyway, neat item to have. That depends on if you are viewing in Iray Viewport or Texture Shaded. They clean up nicely in Iray mode (no jaggies that I can see), and I'd assume in 3Delight as well if for some reason you wanted to use the stick in some rendering project you are doing. The texture map is already 1024 x8192, I was trying to keep the download size below 2 MB (so I could just upload it here). I could double the size of the map fairly easily, if there's interest. If anyone has suggestions r.e. the 'jaggie texture shaded viewport look' issue, I'd love to hear them! I only ever do things in iRay mode, but I was looking at it mainly in Viewport, and never tried rendering anything with it. Does only looking at it in Viewport mode have an effect on it? (Looking at your picture there, it appears it does.) I mainly use these measure wall and measure rod thingies as a quick way of telling at a glance how tall a character is... particularly kid-characters so I can look it up on a dead-tree-variaty reference book to see how old that child character is supposed to be, because the add copy for the particular child character doesn't always say. Lola's Son, for instance, appears to be about the hight of a 9 year old, based on the hight measure doohickies and that book. If you switch your viewport over to Iray mode, it should look prettier. I don't think how looks in viewport>texture shaded mode affects the Iray render in any way though. I also am curious as to why it looks so rough in Texture shaded though. I know that the texture shaded viewport simplifies the textures quite a bit, so that the viewport is much more responsive, so maybe it's just a a 'math casualty'. I'm about to throw together a simplified version with white shadows around the numbers and a 'square-ish' font (to match the background) to see if that helps. Changing the dimensions to 2048 x 8192 (was actually 1200 x 9600 before) didn't seem to help in the viewport, but it did bump the .jpg to just shy of 2 megs. I did a few quick tests with non-italic 'blocky' fonts to see if I could get things to look nicer in the Texture Shaded viewport mode, but it didn't help. I also tried some different map sizes (4096x4096, 2048 x 8192) and that only helped slightly, but other 'stretching' issues crept in with the 4096x4096 one. I'll probably experiment with this some more as time permits, but I think that the 'unusual shape' of the prop (long and very thin) is playing into this somehow. If anyone else has some insight as to how to make this look better in Texture Shaded viewport mode, I'm all ears, but at least you can mostly make out what the numbers are supposed to be. And it looks fine/as I intended in Iray viewport mode, so that's good. It does what I needed it to do quite nicely, loads fast (usually takes about a second for me, that IS fast), and hopefully others will find it useful as well. The problem with the "jaggies" is not an Iray vs 3Delight thing, it is purely a Viewport vs Render thing. The Viewport is not a render and it is not WYSIWYG. The Iray preview mode is actually a render. 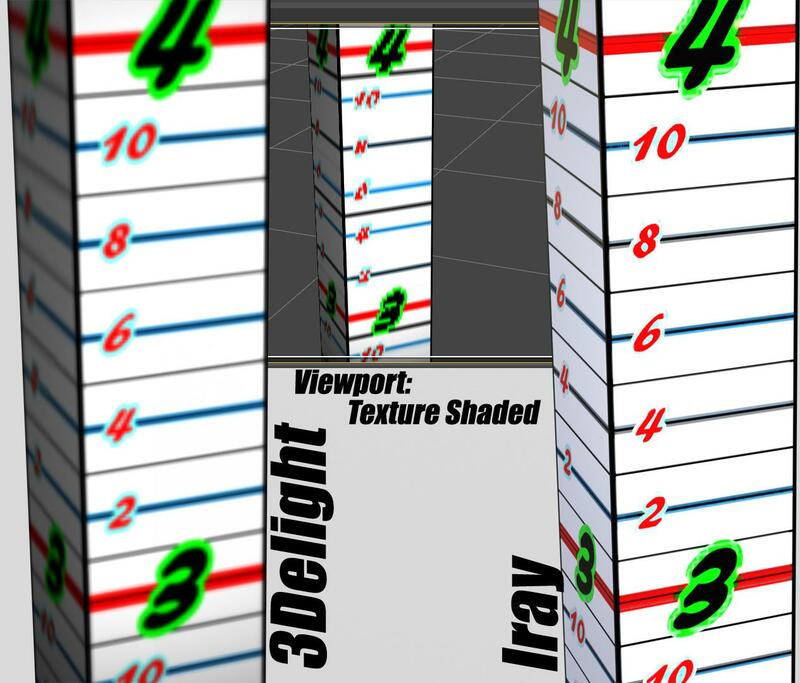 Similarly, using the 3Delight spot render is also a render. Viewing the prop in the normal OpenGL viewport is what causes the poor resolution of the texture and is a limitation of the viewport. To illustrate, refer to the attached composite image showing a section of the prop around the 5 ft. mark, with a screen capture of the viewport on the left, and with a 3Delight spot render in that area shown on the right. The 3Delight spot render looks pretty much like the Iray preview. For responsiveness and memory, the viewport downscales textures (I think it takes them to ~1024 for the largest dimension). I think the only way to improve this would be to break the stick up into multiple mat zones. That or take a different approach - my usual measuring stick actually has modeled markings and numbers. I don't mind. Tools are tools. His would look good on a wall in a doctor's office or something if used as a prop, so I'll keep it in mind.. Mine serves me well, and I like how quickly it loads. I may play around with the 'shaded bars' idea though. I'm already planning on a metric version as well, when I come back to this one. Someone (recreation) was nice enough to make and share an english + metric version of the texture map for this stick. See attached. ...this is a very nice find. I used to use a measuring guide by Meshworks (KPL Originals Height Guide) that was also rather simple. It worked like the type of measuring device one would find in a doctor's office complete with the part that could be moved up and down which would rest on the top of the head. It just had alternating black and white markings for each inch but was still easy to read and use, Apparently it is no longer available (I checked on Share CG where i originally found it and nothing turns up in a search). As I create custom characters, an accurate height guide is necessary for my work. I had a recent HDD meltdown where I lost everything including the Zips for a large number of freebies I had which included the KPL guide. . This is is an excellent replacement and yes so easy to use (also saves me 35$ for Measure Metrics). Thank you.